So, nursing some cracked ribs, the work has rather slowed here aboardship. Did manage to --carefully-- get a little bit done over the last two days. I wired in our antenna, which I'd been meaning to do forever, and mounted our marine vhf radio by the binnacle. This has only taken me. . .what. . . a year? 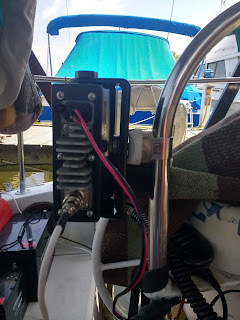 I was rather pleased with myself as I was able to trick up a mount for the radio using an old antenna rail mount. Works pretty well, and as soon as I get the wires all wrangled, should be a pretty neat and convenient installation. Here;s the new mount from the back. Once I get the wires tided up it should be perfect. That's about all I had the energy for, frankly. Early on in designing The Floating Empire, we were casting about for refrigeration options. Fridges are a problem. They require power, have a surge of power at startup, they're bulky, and they often require ventilation around the sides and back. It's an issue. For a bit of time on Empire, we ran with just a cooler and ice (NOT economical), then installed a fairly efficient fridge, which served us pretty well, though it did tax our solar system. 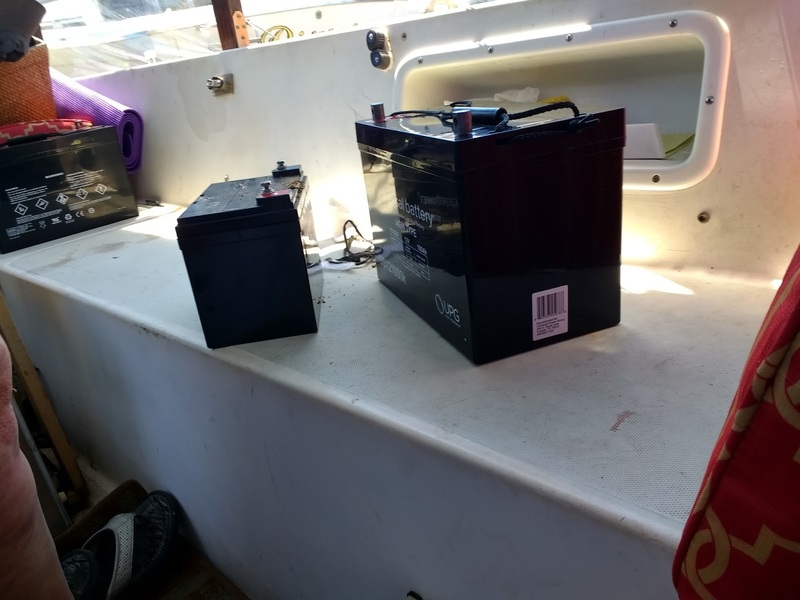 Moving aboard Tesla's Revenge, we had to downsize our little fridge to an even smaller one (with a pretty useless freezer), and had been relying on freezing bottles of water on land to keep a cooler chilled to handle the overflow. Meh. It worked, but not conveniently. A slipmate loaned us an ice maker, which was convenient, but also a major power hog. In planning on doing some travel, it was clear that NONE of these options were really workable. Then we remembered something we'd contemplated early on in the planning of our original vessel. One of the most efficient of small cooling units you can find are small medical freezers. They're REALLY cold (-17 fahrenheit or so), and well insulated and highly efficient. We decided to give the idea another shot. 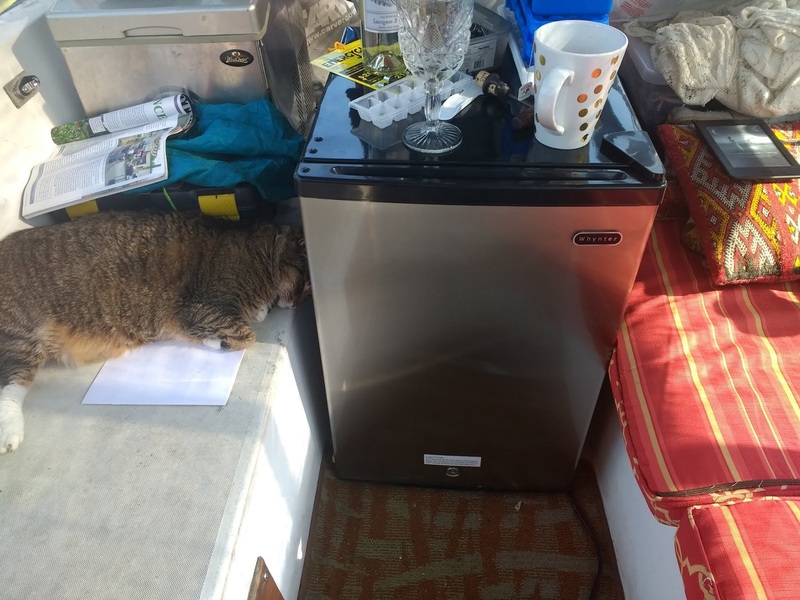 A large cat sleeping next to our new 2.1 Cu Foot Freezer. The cat is on the left. Accordingly, we've gotten a Whynter 2.1 Cubic Foot freezer (the same size as our original fridge) and put it in the cockpit where the ice maker usta live. We'll be using it as a. . .well. . .freezer, freezing foods, making ice for drinks, and making ice to keep a new 40QT supercooler cold for our non-frozables. We'll let you know. 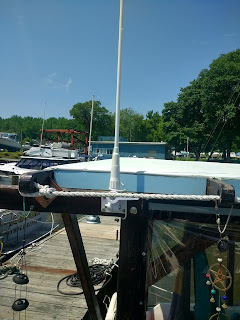 I'll be ditching the fridge and turning that space in the galley into much needed storage.
. . . .not the boat's ribs, mind you, mine, but we'll get to that. In the process of getting Tesla's Revenge ready for travel, we knew we had to replace the battery stack. The current stack, composed of eight, 35 AH batteries ( and somewhat elderly ones at that ) was inadequate even for staying off grid most of the time, let alone powering the drive of the boat. Accordingly and in our right minds and everything, we measured and, debit card in hand, ordered in 8 new, 100 AH deep cycle batteries. Now before I get any further, yes, I know lithiums would have taken up less space and yes I know they weigh less and yes I know they have greater energy density, etc. Yep. Got that. We just don't have the cash to lay out for Lithium-Ion cells at present. Also I found a good deal on the lead acid gel cells we're installing. They weigh like they look, just short of 80 lbs. each. So we cleared out space for them in the bilge, putting in some new supports and anchoring in battery boxes to protect them. Here's the center battery compartment. The remaining four will go in the stowage compartments port and starboard. Wiring up the new stack was a cinch since we already had the connectors, but lowering these monsters into place was another thing entirely. Dropping in the third one, I slipped, came down hard on the compartment edge on my side, and something went "grunch". Ow. So now the next four are gonna have to wait a bit as I'm in pain and wrapped in elastic bandage. The good news is the four we have wired in are working spectacularly. We're off grid 24/7, just went through some major cloudy days with no problem, and, in general, we're really pleased. Should have done this ages ago. Lots more to do, of course. We've four more to load and wire in, we're replacing our fridge with a medical freezer (surprisingly more efficient ), and then, of course, there's the drive, but we're making rapid process. . . .
. . . If I can just stay in one piece. More shortly. Enjoy the spring. 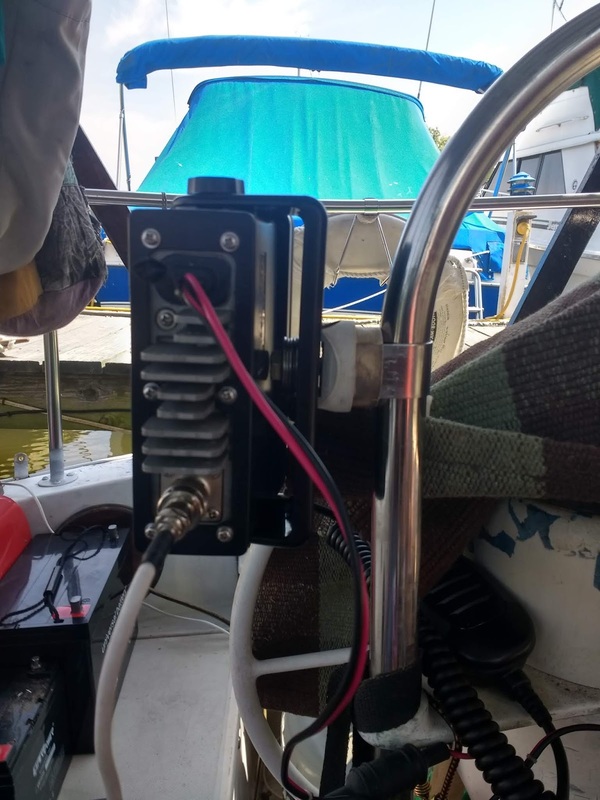 Liveaboards, in my experience, fall into two categories: 1) We have enough money to do this, so we're doing it, and 2) We don't have any money so we're doing this. We rather fall into the second category. 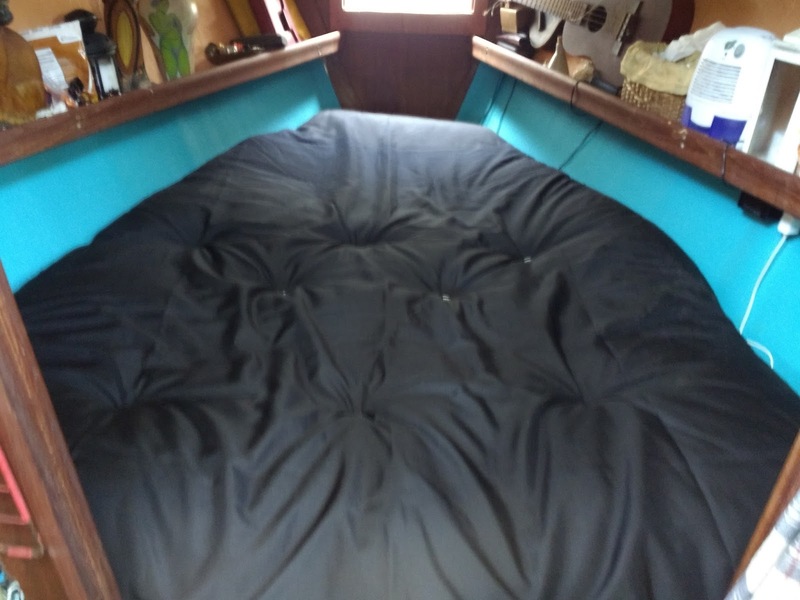 One of the greatest discomfitures of living aboard boats tends to be bedding. The reasons are many: Weirdly shaped spaces mean traditional mattresses often simply won't fit (and often won't even go belowdecks). 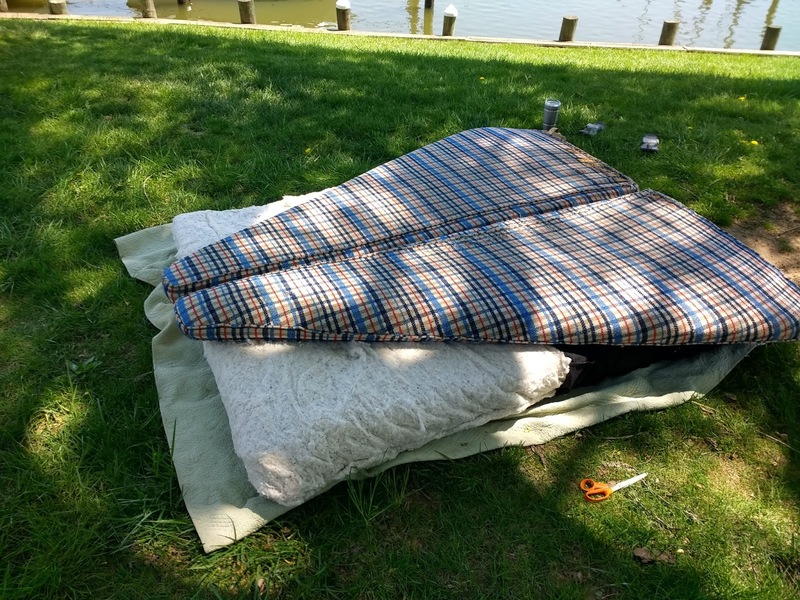 A thick mattress takes up space you don't have, and, let's face it, most boats are regarded even by their manufacturers as pleasure craft, intended for only temporary habitation at best, and if your drunken friends wind up passing out on a three inch mattress, so be it. None of the preceding are conducive to a good night's sleep. So it was with Tesla's Revenge. We've been sleeping in the V berth on 70's era foam which was, to say the least, beat down. It was long past time to do something. 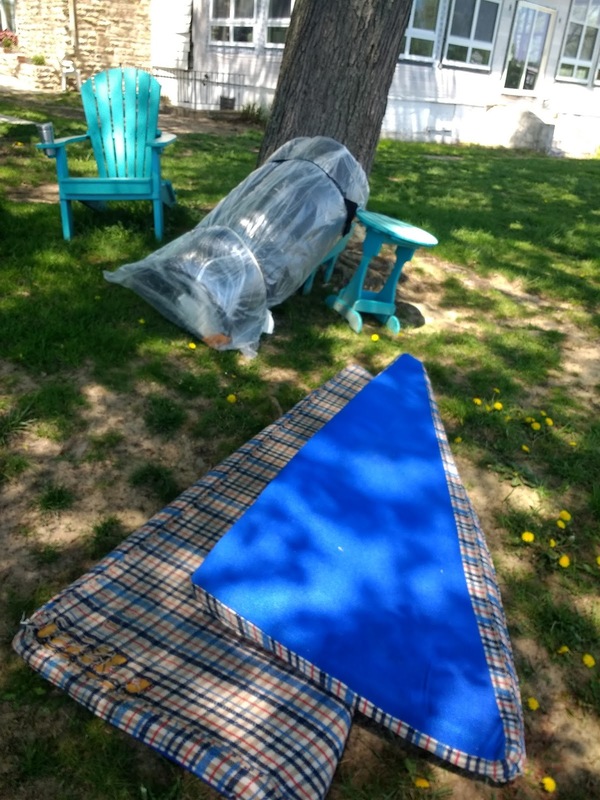 After casting about and looking at the amazing expense of foam, let alone the cost of custom cushions, we decided to take matters (and mattresses) into our own hands and try to find a mattress we could modify for the space. 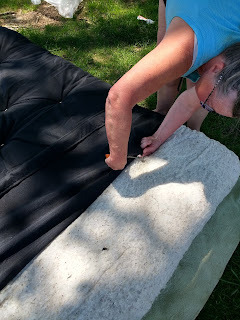 Both being a fans of futon mattresses (okay, so we're old hippies), we thought we'd bite the bullet and see if we couldn't modify one to fit our V berth bedroom. 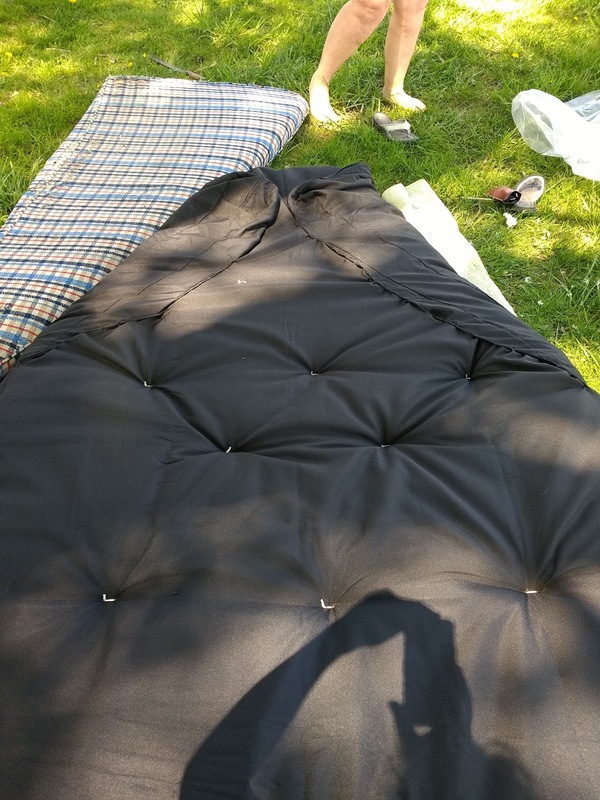 After a bit of casting about, we managed to find an inexpensive, American-made (how the hell did THAT happen) futon mattress at a Big Lots for just under $100. The conversion proved to be surprisingly simple, and the results surprisingly comfy, so we thought we'd share. Here are the two halves of our old, beat to crap V berth cushions and a new, American made futon mattress from Big Lots. Peel back the cover, clipping the places where the mattress is sewn through the cover. Here we go. Here's the old cushions atop the stripped mattress. Using a long carving knife and scissors, cut away the excess mattress stuffing. Some of these mattresses are just filling, some have a foam center. Either way, the process is the same. 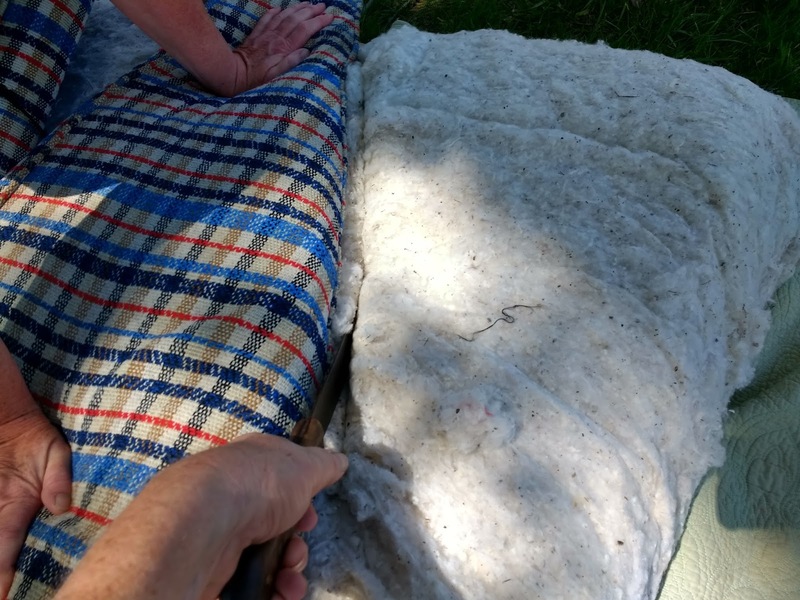 Cut the excess mattress material away to match the original cushions. 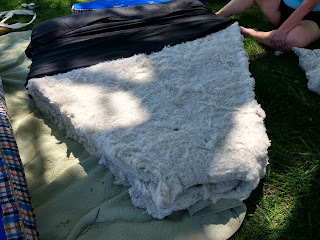 Here's the trimmed mattress batting. We left the top intact as we didn't need to cut it. 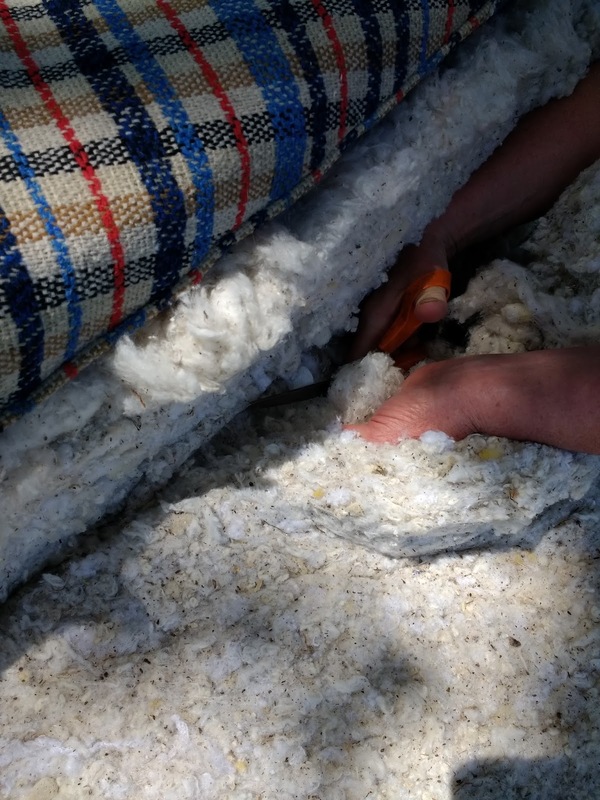 Pull the mattress cover back into place and fold it over the removed sections of the stuffing. 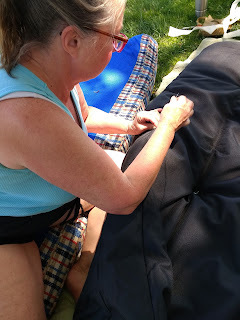 . .
...and stitch the mattress cover back in place. So here's the cut mattress with the cover stitched back into place, folded over the removed sections. And here we are in the V Berth. MUCH more comfortable. The whole process took only about half an hour and I'm amazed we hadn't tried it before. We slept on the new bed last night, with plenty of padding and no low spots. This really worked well. We're contemplating trying the same idea for new galley cushions. Give it a shot. There's really nothing to it. We got lots done today on Tesla's Revenge, setting in new snaps on our roll-up plastic glazing (okay, so I miscounted when we installed it and wound up just screwing some of it in place), and putting in new lifelines to replace the nasty plastic covered stainless steel cable ones we inherited with the boat (the new ones are an aramid, and just as strong). 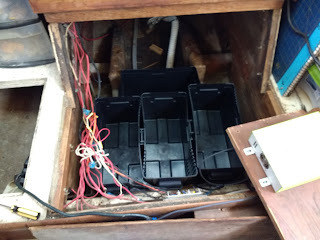 The new battery boxes showed up yesterday, and the new batteries Tuesday. We're getting there, folks.